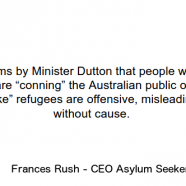 The claims by Minister Dutton that people who seek asylum are “conning” the Australian public or indeed are “fake” refugees are offensive, misleading and without cause. CEO, Frances Rush, says his comments fly in the face of what we see here at our Centre on a day to day basis and will have a serious detrimental impact on people with strong and credible claims for refugee status. “The thought of ‘conning the Australian taxpayer’ is the absolute last thing on their mind. The truth is that many people were barred from applying for protection by the Government until late 2016. So not only have they already been waiting for several years, but the constant flow of changing and confusing announcements coming from government over several years has added to their trauma. “A typical example of the people impacted by the fast-tracking process is a single young man we are supporting who fled his home country alone during a civil war which saw most of his family killed. He has had no access to interpreters or legal support due to the government’s cancellation of these services. The man is also suffering a high level of trauma and has limited English. This makes it very difficult for him to articulate his case without the aid of an interpreter and a lawyer. He has already waited more than 3 years to be even invited to apply. “At the Centre, we are already seeing an increase in people presenting with suicidal tendencies, anxiety and subsequent hospitalisation,” said Rush. The application is a complex 60-page form that is only available in English and must be completed in English. It is 40 pages just for a baby. For many people this will be impossible to achieve and even with the assistance of an interpreter and a lawyer it can take up to 14 hours to complete. “While the Government continues to target people who came by boat, the Department of Immigration and Border Protection has fallen well behind in processing 13,000 people who have already lodged their claims but are still to have them assessed. Rush said that the Centre is already seeing an unprecedented number of people seeking assistance. “We are working closely with the Refugee Advice and Casework Service to assist as many people as possible who are affected by the ‘fast-track’ process and have increased our legal resources to enable as many as possible to meet these extremely tight deadlines.